Beagles are driven by their noses. Dogs' personalities are a combination of genetics, environment and training, and a significant portion of a dog's temperament is determined by early socialization. However, the beagle -- like all dog breeds -- has its own personality with a unique set of traits to which it is predisposed. 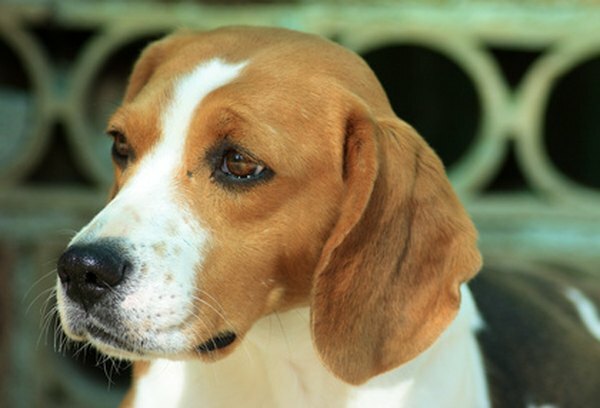 Beagles are extremely popular dogs because of their gentle, even-tempered nature. With minimal socialization, your beagle will bond strongly with people, be gentle with children and get along with other dogs. Beagles are loyal to their families and often highly affectionate. Beagles are highly energetic dogs, which means your pup will always be thrilled to play fetch or chase with your family. The downside of this is that beagles can become destructive if they don't get enough exercise. At minimum, they need an hour of exercise daily in the form of brisk walking or running and intellectually stimulating games. Some beagles, particularly puppies and young adults, may need much more exercise than this. Like all dogs, beagles have a finely honed sense of smell and hearing. Beagles, however, were bred to be hunting dogs, which means they're much more likely to be distracted by sounds and smells. They tend to chase small animals and may struggle to get along with cats and other small household pets. Early socialization to small animals can help reduce the beagle's desire to chase them. Beagles are intelligent dogs who are eager to please. They also have an independent streak and can be stubborn. Owners often have to spend more time house training beagles than they do with other breeds. Using reward-based methods, consistency and patience, you can muddle through training frustrations and help your beagle become an obedient, well-trained member of your family. Does the Beagle Have the Best Sense of Smell? What Do 8-Week-Old Beagles Eat? Are Siberian Huskies Hard to Take Care Of?